There’s no question the 2018 Mazda CX-9 7-passenger SUV is a gorgeous specimen. 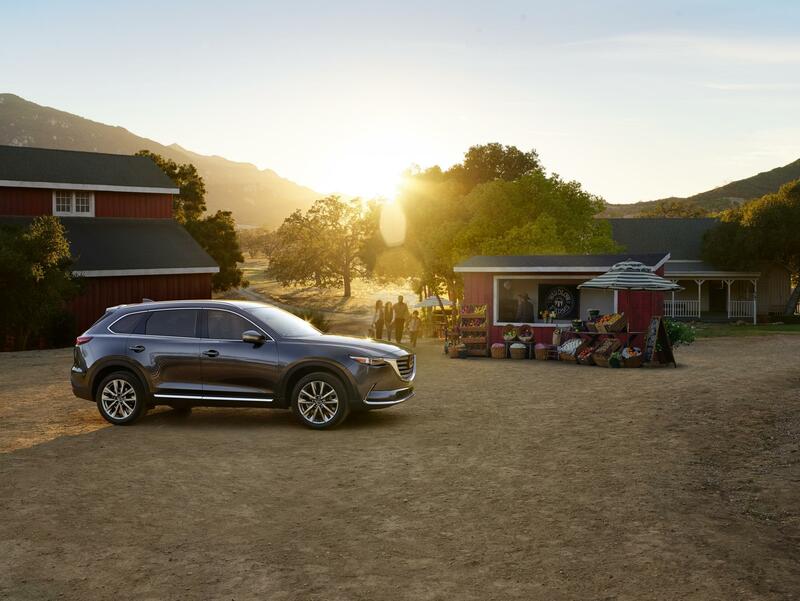 It isn’t just for looks, though, that positioned the Mazda CX-9 as a finalist for North American Utility Vehicle of the Year as well as World Car of the Year. The updated 2018 Mazda CX-9 has more technology than ever, enhanced safety, and value-added features that make it ideal for life in the Maritime provinces. In Nova Scotia, you’ll find a wide selection of Mazda SUVs including the Mazda CX-9 at Yarmouth Mazda. Just two years ago, the Mazda CX-9 was all-new. This model year, the 2018 Mazda CX-9 gets more options as standard equipment and even better comfort behind the front seats. · The second-row seating has been made even more comfortable for 2018, and access to the third-row seat is easier to access. · Silence prevails in the 2018 Mazda CX-9 with improved sound insulation. · Smart City Brake Support is standard equipment on all Mazda CX-9 trims for automatic braking ability in low-speed driving situations. · Blind Spot Monitoring and Rear Cross-Traffic Alert are now standard equipment on all CX-9 trims. The value-conscientious shopper will truly appreciate the entry-level CX-9 GS trim. For a 7-passenger SUV, its equipment is like none other. LED headlights and taillights are standard equipment, as are 18-inch alloy wheels. 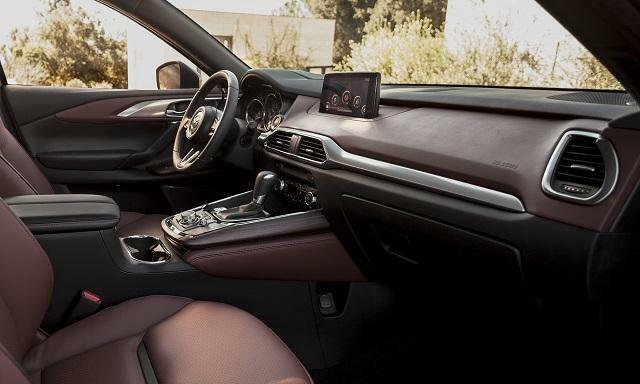 It’s premium cloth interior has MAZDA CONNECT infotainment with a 7-inch touchscreen, complete with Bluetooth phone and audio streaming. An additional Sport Package is available, adding heated front seats and a power driver’s seat. The Sport Package also includes auto on/off headlights, High Beam Control, Lane Departure Warning, Lane-Keep Assist, Smart Brake Support, rain-sensing wipers, and full-speed Mazda Radar Cruise Control. With equipment like this, the Mazda CX-9 can help you adapt to the ever-changing conditions on the East Coast of Canada. In addition to the equipment in the GS trim, the GS-T trim level adds leather seating surfaces, a power liftgate, Advanced Keyless Entry, an 8-inch MAZDA CONNECT screen, and a Homelink-equipped auto-dimming rearview mirror. A Premium Package is also available as an add-on option, including LED fog lights, navigation, a Bose audio system, front and rear parking sensors, a sunroof, and retractable sunshades in the second-row doors. The GT trim elevates the 2018 Mazda CX-9. It adds 20-inch alloy wheels, Adaptive Front Lighting, Active Driving Display head-up display, heated second-row seats, a heated steering wheel and windshield wiper de-icer. It’s perfect for life in Yarmouth and the rest of the Maritimes. At the peak of the CX-9 lineup is the Signature edition. This premium package includes Auburn-colored Nappa leather, rosewood interior trim, and LED signature grille and interior lighting. The 2018 Mazda CX-9 isn’t just a 7-passenger SUV with great interior equipment. It also performs among the best in its class. Each CX-9 comes standard with a 2.5-liter SKYACTIV-G four-cylinder, producing up to 250 horsepower. Standard on the GS-T, GT, and Signature trims and available on the GT trim is Mazda’s iACTIV AWD with real-time monitoring and predictive response for the ultimate in traction. Even when equipped with iACTIV AWD, the 2018 Mazda CX-9 is fuel efficient. It achieves an EPA-estimated 11.5 l/100km in the city and 8.9 l/100km on the highway so you can pass by the fuel station more often than ever. When you need a 7-passenger SUV in Yarmouth, choose the 2018 Mazda CX-9. With a robust lineup that’s equipped with more tech and features than ever, you can’t go wrong. You’ll find the Mazda CX-9 at your local dealer in Nova Scotia, Yarmouth Mazda.